We at Choco Crafters provide the highest quality custom chocolates for corporate events, promotions, gifts, weddings and occasions of all kinds! Available in milk, dark or white chocolate as per your client's Logo, Message, Slogan and Design, Shape and size. We can underatke the complete chocolate customization and personalization with your custom design, including logo, text and any other design elements and can come out with a theme in line with your occasion . Your company logo can be cleanly recreated in chocolate and makes for an ideal design element. 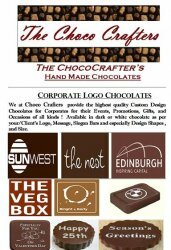 Add your logo to yourchocolate design to strengthen your brand. Ideal for Tradeshows, events, conventions and employee giveaways. Choco Crafter's Chocolates are a major hit at corporate events. Customers use them as appreciation gifts for events, meetings, seminars and more. Since each product is custom and small text renders clearly on the chocolate it is simple to add your event details and date, thank you message, product logo and more. The design is up to you and can be provided as a simple image file which we convert to custom chocolate. A large number of acclaimed Corporates have appreciated and use our Custom Logo Chocolate solutions to give them that extra edge and create a lasting impression. Products can be used a custom business cards including your custom chocolate logo, for trade show give aways or included with mailed marketing materials. In addition, cusomized box packaging enables easy mail outs! We also have the complete logistic solutions to ship them accross India, with a wellplaced SCM & Logitics placed.